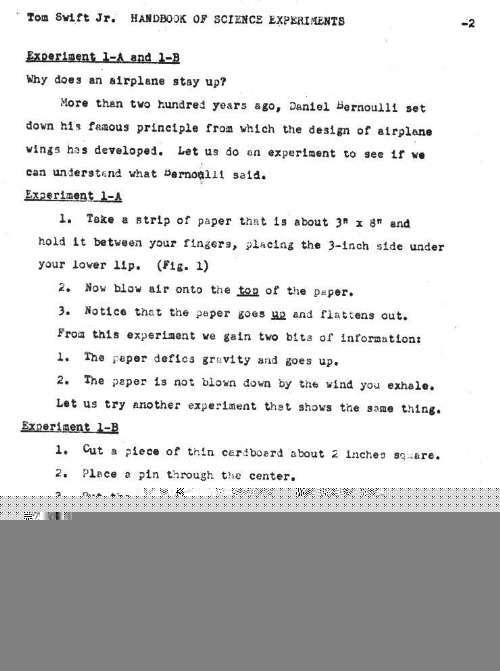 So you say that you've never heard of the book Tom Swift Jr. Handbook of Science Experiments? Well, if you had heard of it I would have been surprised, for the book was never printed. It exists only in manuscript form, with the manuscript itself residing at the New York Public Library. The only way I found out about it is because some time ago James Keeline took a trip to the NYPL and browsed through box upon box of old Stratemeyer Syndicate records. He discovered the old manuscript, and when he returned home he told David Baumann, who in turn told me -- and I am very grateful that they did. After I heard of its existence, I wrote to the NYPL and asked them to send me a copy. They did, too: after a few months of patiently waiting, an envelope with 134 pages of manuscript appeared in my mailbox. After carefully reading the pages of manuscript and after getting permission from the NYPL to create a web site, I decided to create a page revealing what I found out about this phantom title. The manuscript, as I received it, was very confused. It appeared that the book went through several stages. At first it wasn't going to be a science projects book at all, but Tom Swift Jr.'s Space Age Guidebook. 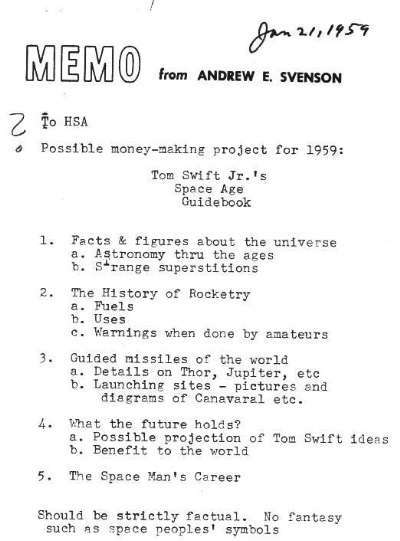 The memo for this book, written by an Andrew E. Svenson, is dated Jan 21, 1959 and lists the idea as a "Possible money-making project for 1959" -- which would place it at right about the time of Tom Swift and his Electronic Retroscope (#14). The idea sounds good to me, but evidently it wasn't popular with the people inside the Syndicate. The idea was recycled into the Tom Swift Jr. Handbook of Science Experiments. The conversion seemed to take about six months: a memo dated February 1960 is entitled Tom Swift Handbook of Science Experiments Chapter I and has a very positive comment about the story. The experiments were all on the elementary, grade-school level. The book answered such questions as "Why does an airplane stay up?" "How does the strobe effect work?" "How can I build a machine that measures the flow of electrons?" and so forth. It discussed surface tension, ecosystems, and the chemical nature of water. There were no repelatrons or atomic motors, much to my disappointment: I had always wanted to know how Tom's gravity neutralizer worked, but I guess I'll never know. Perhaps that was too closely guarded a secret to be let out in a science-projects book. 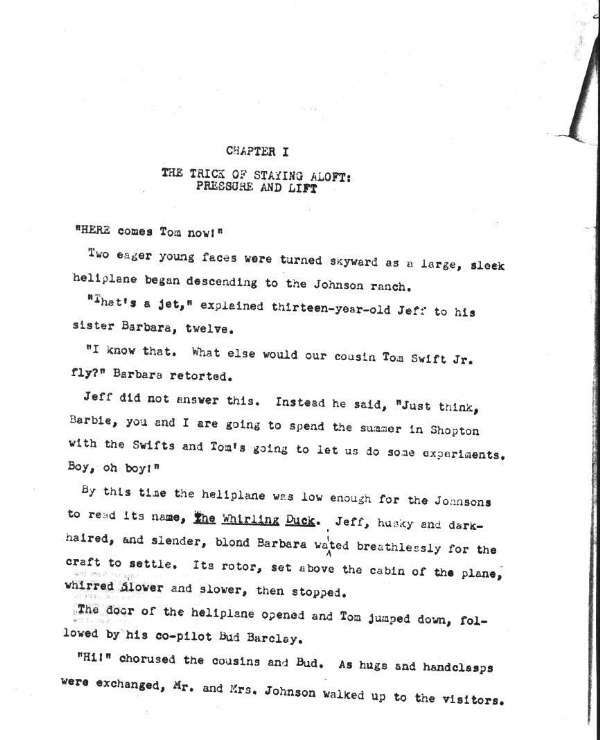 The story -- which was written up to the end of Chapter IV before the book was cancelled -- had two main characters by the names of Jeff and Barbara Johnson. Jeff was 13 years old, Barbara was 12. The book claims that these two people were cousins of Tom Swift Jr., but that is impossible: both his mother and father were only children. Anyway, these two people who -thought- they were cousins of Tom lived "out west", next door to the ranch where Chow Winkler worked as a chuck wagon cook before he went to work for Tom. As Chow was always a Texan at heart, I think it's safe to assume that the Johnson's lived in Texas. The Science Projects book states that that they had never met Chow before: he had been hired by Swift Enterprise and moved to Shopton while they were still very small children. If this was the case, and since Tom Swift Jr. was 18 when the series started, it would mean that Tom was about 8 or 9 when the Swifts met Chow -- which would place the meeting in 1945, about ten years after Tom Swift and his Planet Stone. To get back to the story: the two Johnson children had been invited by Tom to spend the summer with Tom at his laboratories, Fearing Island, his Outpost in Space, and wherever else he might happen to go. The purpose of their trip was to teach them all about science -- and I think that they certainly picked a good way to do it! The Johnson's meet several familiar characters: Tom Swift is all throughout the book as the teacher, Bud Barclay is always present as Tom's co-pilot and chum, and even Chow plays an important role as a sidekick, fancy-shirt-wearer and cook-in-chief. Mary Nestor Swift makes an appearance as well, although Tom Swift Sr. is strangely absent. The cousins travel to a variety of places: they visit Swift Enterprise, Fearing Island, the Citadel, and the Outpost in Space. The solar batteries are mentioned, although the Flying Lab doesn't make an appearance. Neither does Tom's Challenger: Tom and the Johnson's flew up to his Outpost in Space in an ordinary cargo rocket. The science in the revision of the book is roughly the same as in the original, with the exception that it is explained a lot better and in more detail, and that more complicated subjects like electrolysis and fuel cells are discussed and explained. The revised book was truly fun to read: it's disappointing that it was never finished and released. From the memos enclosed with the manuscript it looks like the Syndicate was excited about the book: I'll probably never know why they decided to cancel it. It is a real shame, though, especially after all that hard work.